Event and conference management is definitely a growing business around the world. We often hear news on different kind of events such as musical programs, live concerts, sports events, street events, talk shows, workshops, orientation, and many others. But does these event companies gain enough customers and grow business through only local promotions? Definitely not. Exploring such events via websites is the best and instant way to enhance the value of such an event and helps in making it popular and attract more people. Hence, a powerful website is required to make the event more professional and let people around the world be aware of it. As WordPress is among the popular platform for creating websites, people preferred it more than any other platforms to build their website. Likewise, event organizing enterprises would want to find the best free event WordPress themes to build websites for their companies. Every business can only get success if it’s being promoted and marketed in a right and genuine way. Companies who organize different types of events should not fall behind in taking the huge advantage of the internet. 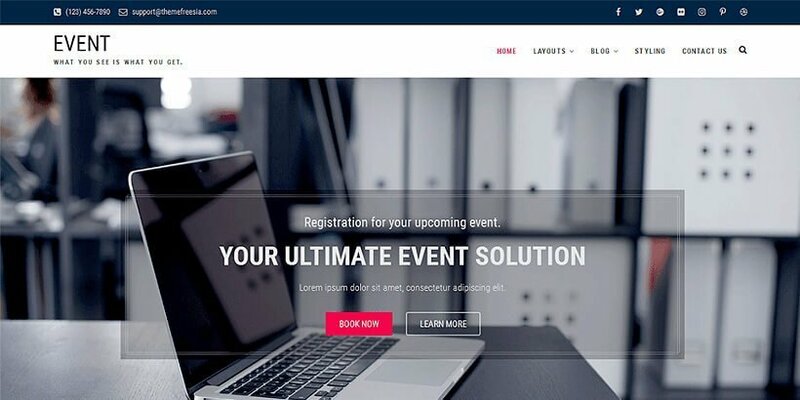 In this article, we have prepared an awesome list of WordPress themes that is literally for event and conference management companies. All of these themes have been selected from the best ones in the market. Event Star is a splendid WordPress theme entirely based on event and conference management. It has been crafted with marvelous design and standard coding. This theme suits best for any kind of event show and function. Its main objective is to be a suitable theme to promote any event show like a sports show, beauty pageant, lecture etc. globally via the website. The theme has enormous and useful features which people will love. If you are in search of the theme to explore your event management company then no need to look further. With its modern and standard look, your business can run smoothly at a high pace. It has the best and unique features particularly related to events like event countdown widget, event schedule widget, online booking etc. This highly responsive theme fits perfectly well in all screen size. Besides that, it has good compatibility with almost all kind of plugins to extend the functionality and flexibility of your site. Event Free is one stunning WordPress theme for event and conference management. The layout design has an amazing look and feels and is best suited for any kind of event management. If you want to make an online presence of your event company and showcase all its programs and events then this is one of the best options for you. It has all the necessary features and functionalities required for every event management companies. If you want to alter the classic look of the front page and make it more colorful then you can use the color option in the admin panel and make your site look different as you want. The theme is highly translation ready and your site will be ready in a different kind of language. 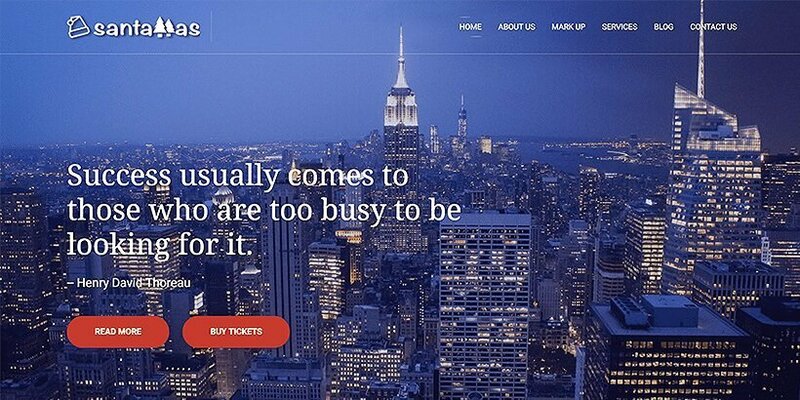 Sungit Lite is an outstanding looking WordPress theme for event management. 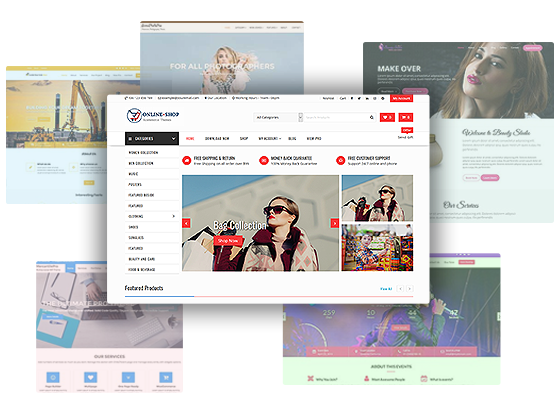 The theme has been created specifically for Musicians, Bands, Artists, Concerts, Events or any kind of music websites or Blogs. It is easily customizable and the user can modify the theme as desired. Let the people around the corner know about your upcoming and latest concerts and events. An easy way to promote your event company in a creative way while enjoying playing with the exciting features. This highly responsive theme will let your visitors view your event details in their smartphones and tablets. Create various new pages in your site and even design the theme as you wish by using the various widgets available in the theme. Note: You might also like to know about the best hosting provider for your WordPress website. Well, we would like to share with you the best WordPress hosting. You will find there an awesome list of some best hosting provider for your website. 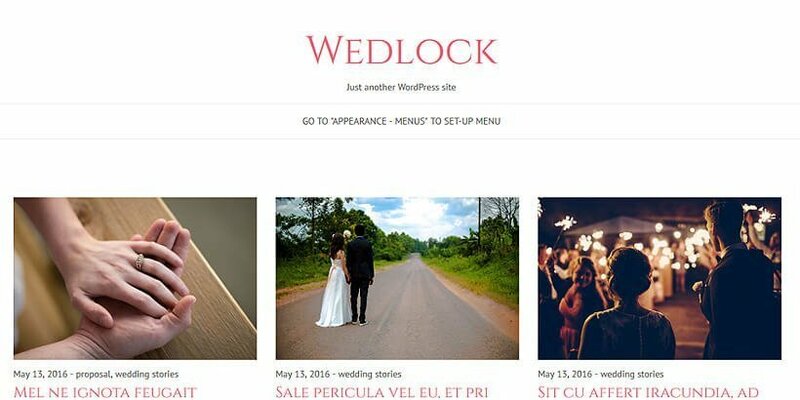 Wedlock is a WordPress theme particularly based on an event such as a wedding. Basically, it has been created to build a beautiful wedding event or ceremony. Mostly there are many event companies who organize marriage ceremony so they can use this beautiful theme to their advantage. The layout on the theme has been structured perfectly and is ultimately a suitable one for a wedding planner. You can use its live customizer to make minimal changes on your sites such as updating the header, logo, footer, and other functionalities. 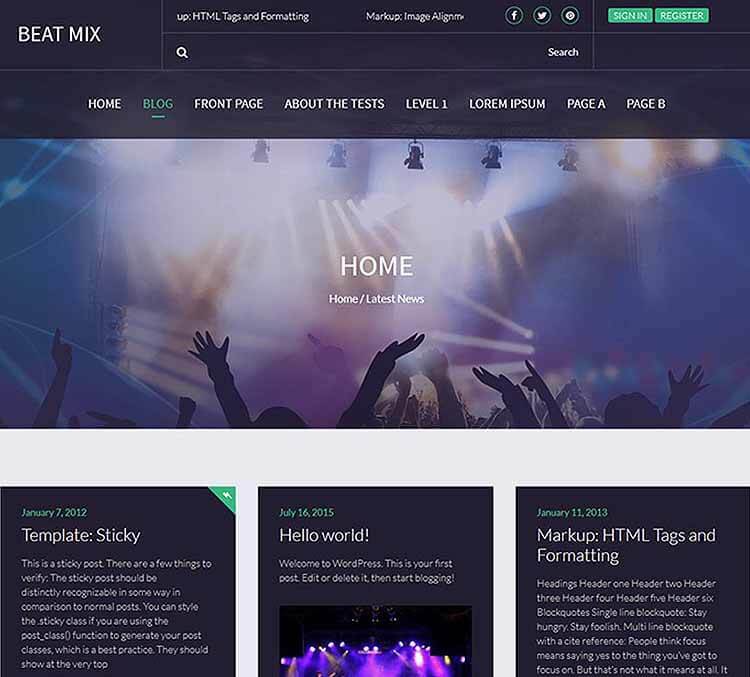 Beatmix is a fascinating event based WordPress theme. Made especially for an event such as music concerts, unplugged show, musical shows, musical contest etc. If you are looking for a theme to promote any kind of musical event this is an ideal one for you. You can customize the theme by yourself with very much ease. It comprises some best and amazing features to make your website look absolutely fabulous. Make your site lively and charismatic and attract your visitors. 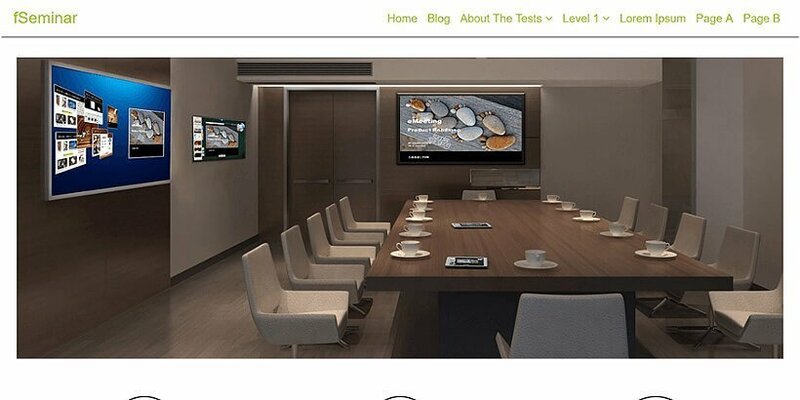 You can even share your blogs and event stories on your site. The theme comprises of many interesting features that will make your site a fabulous one. 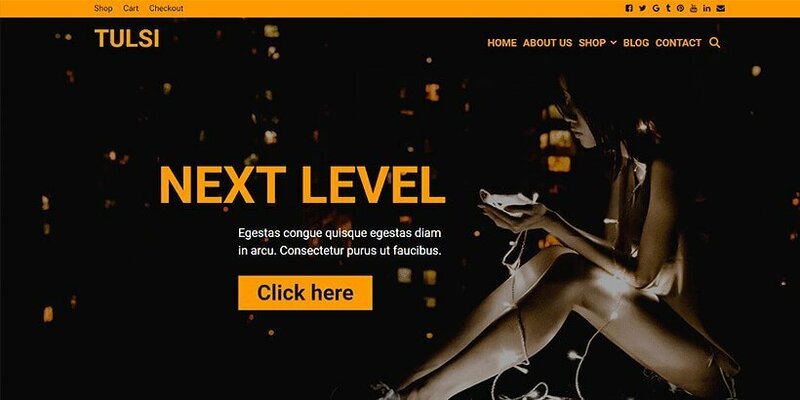 The feature like parallax page title is something you will enjoy using on your site that will simply enhance the mobility of your site. 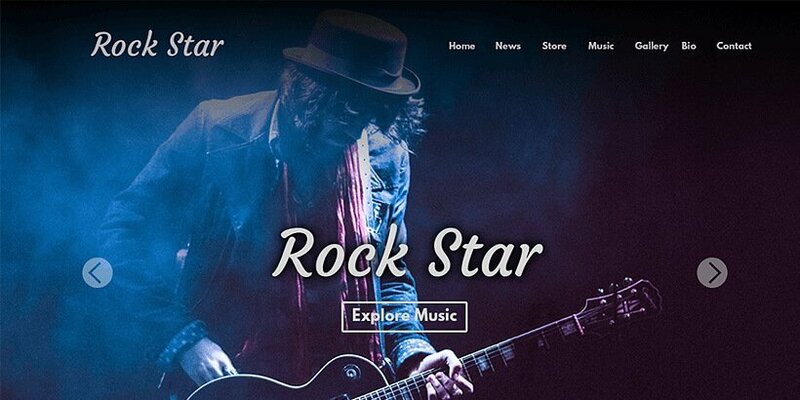 RockStar is a stunning WordPress theme mainly focused on the musical event. 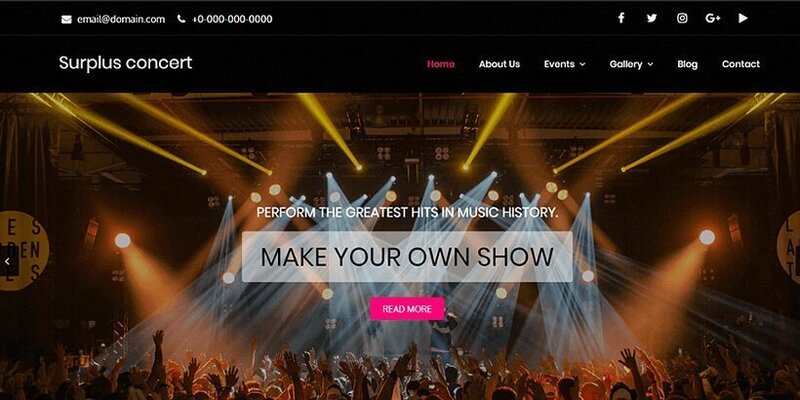 The layout design and features have been created to make it a best and ideal one to promote any kind of musical event such as concerts, musical contests, unplugged programs etc. A website is a great way to showcase musical shows and events online and let people know about it. Probably, a preferred one for any kind of rock and concert related event company. The theme comes with some amazing features that will blow your mind. You can translate your site in some other language to let people from different parts of the world get familiar with the site. Set your own feature image on the feature slider of the front page to promptly grab the attention of visitors. The conference is a stylish and modern WordPress theme build precisely for event and conference management. If you have any kind of event organizing company then you would want to have a special website for it. Well, do check out this theme as it has been designed perfectly suited for all kind of events. The site is well speed optimized and loads promptly once you visit different pages. It is a translation ready and RTL Scripts ready so you can easily have your site ready in other languages making people from different countries around the world view your website. The theme is also RTL Scripts Ready so it is quite a helpful feature for another form of languages. It also has very good compatibility with WooCommerce so you can open an online store and showcase various kinds of products of your choices. 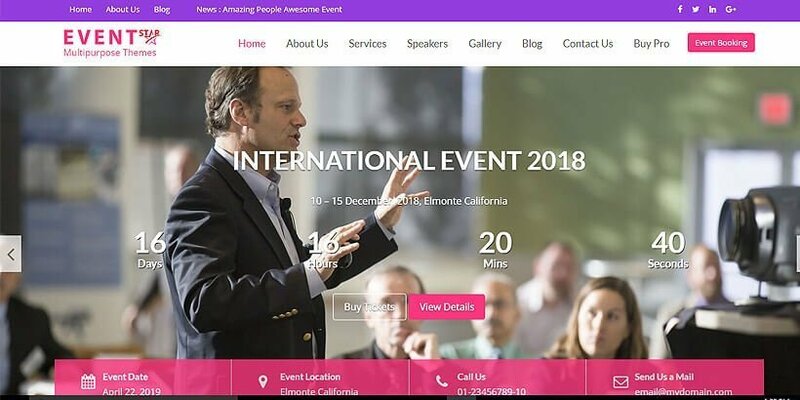 VW Event Planner is an astonishing and modern free event WordPress theme and is constructed on event and conference management. 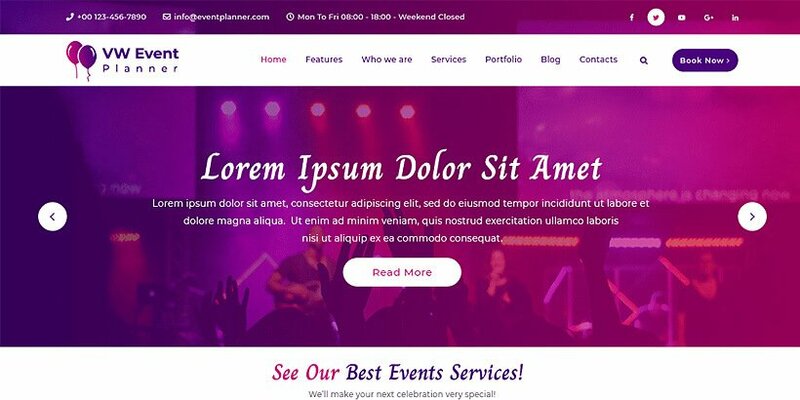 The colorful appearance of the theme is surely a captivating one and will make cool event website. The theme consists of some great features which you can utilize well while customizing the theme. In this theme, you can not only create a list of events but also make booking system where visitors can easily book event from your website. Showcase the main attractive events on the feature slider to get it noticed among people promptly. You can modify the header, footer and sidebar section in your site easily with minimal effort. Moreover, you can add as many widgets as you want and simply different source of information of the event on your website. 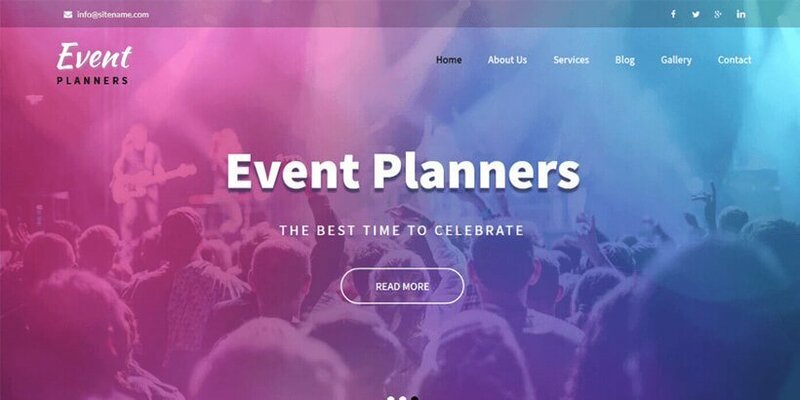 Event Planners is a splendid WordPress theme entirely based on event and conference management. It has been crafted with marvelous design and standard coding. This theme suits best for any kind of event show and function. Its main objective is to be a suitable theme to promote any event show like a sports show, beauty pageant, lecture etc. globally via the website. The theme has enormous and useful features which people will love. If you are in search of the theme to explore your event management company then no need to look further. With its modern and standard look, your business can run smoothly at a high pace. 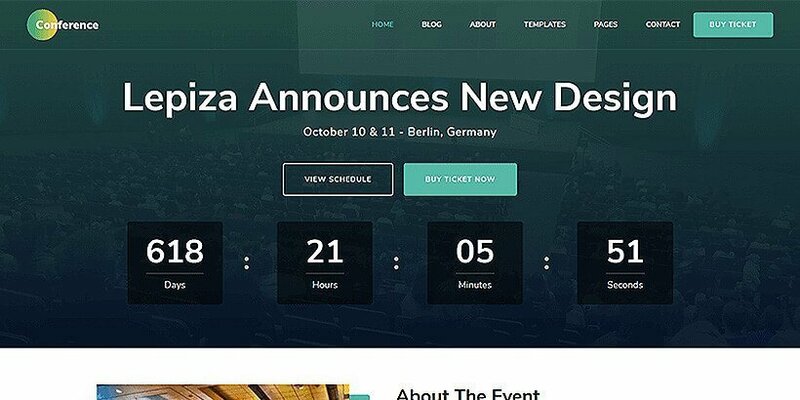 It has the best and unique features for any event showcase like countdown widget, online booking etc. If you are someone who wants some fancy and wild theme with loads of colors and fun then Lingam is highly recommended for you. 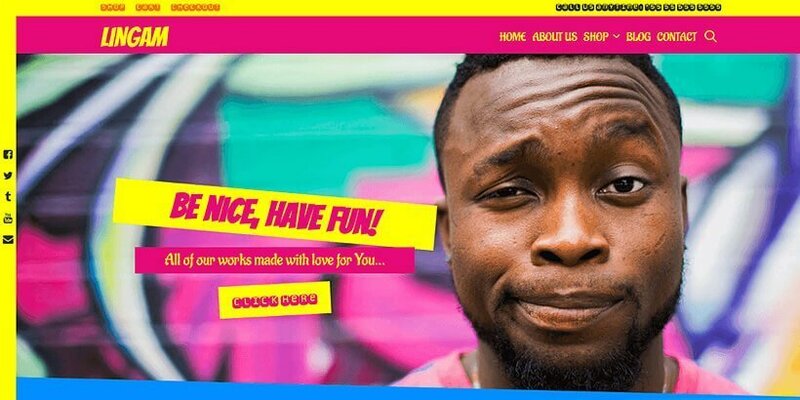 Yes, this unique and compelling WordPress theme is a good choice for creating a minimalist and fun website for event management and promotion. Also if you check out the theme you will find a huge range of innovating features and functionalities. It is fully responsive and adapts well in all modern electronic devices such as smartphones and tablets. It has very good compatibility with different kind of plugins that includes Elementor, WooCommerce and much more. Modify and manage the header, footer and logo section of the theme smoothly as it is easily customizable. Even changing the color range of the theme is just an easy task and you will definitely adore designing different layout of the theme in your own way. Tulsi is a stunning WordPress theme highly focused particularly on musical events and any other kind of events. 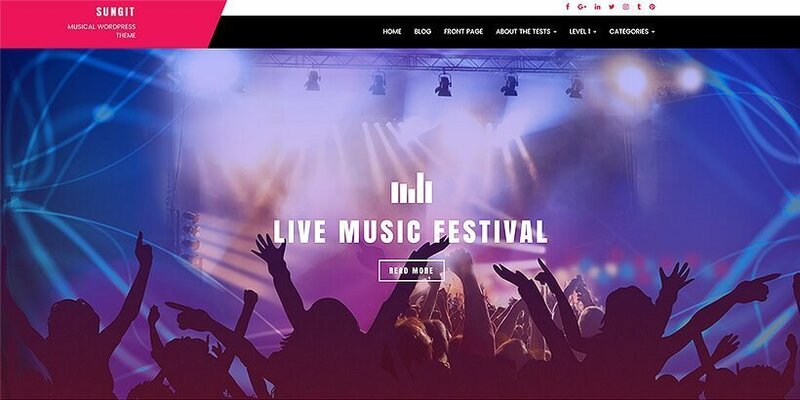 The entire design of the theme has been created to make it a best and ideal one to promote any kind of musical event such as concerts, musical contests, unplugged programs etc. The theme has lots of thrilling features to offer to its users. It has an extremely fantastic and fast loading speed. With every click, you can get the page load swiftly in no time. It has good compatibility with WooCommerce so if anyone who wants to display and promote their products to sell online can use the WooCommerce plugin and activate it in the theme. NightSpot is a classic and sleek WordPress theme distinctly focused on musical events such as concerts and live music. To promote a musical event and programmes this theme is a well preferred one. Since it is an easily customizable theme for a people who are non-techy or don’t have any coding knowledge can easily manipulate the theme in their own way. As it is an extremely responsive theme, it can be seen flawless on mobile devices and tablets of any kind of screen size. If you are not comfortable with its dark front look of the theme then you can update color and make it more colorful and glamorous as per your wish. 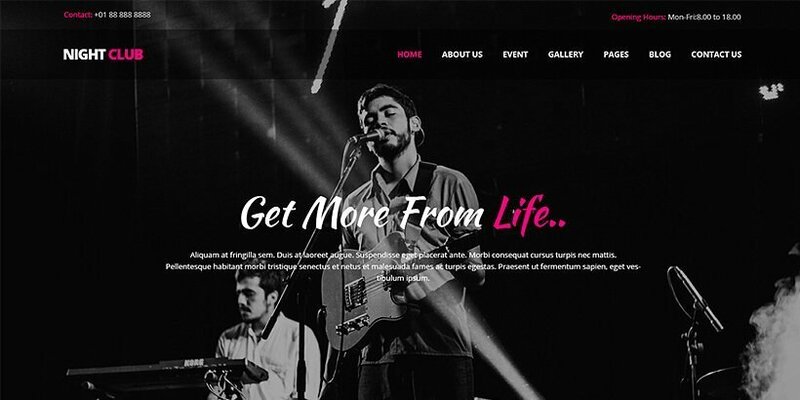 Surplus Concert is a mesmerizing and tempting event based WordPress theme. This theme has been crafted elegantly particularly for an event such as music concerts, unplugged show, musical shows, musical contest etc. If you are looking for a theme to promote any kind of musical event this is a good choice for you. You can customize the theme by yourself with very much ease. It comprises some best and amazing features to make your website look absolutely fabulous. You can create different pages for other titles and design its layout as you want. Modify the header and footer part of your site with color, text, and image of your choice. Anyone who wants to have hype and powerful design to promote any live concert or any other events then this is the best choice for you. If you are searching for a modern yet decent looking WordPress theme for a site for conducting any kind of seminar, conference, meetings etc. then fSeminar is the best option for you. The theme offers some of the awesome features which will make your site look outstanding. It is highly SEO optimized so you can sit relax and be positive about your site’s ranking on a google search. Though being a simple and minimalist theme it doesn’t let its users down as anyone will definitely choose for just a simple event website. Also, it works well on all kind of web browsers like Mozilla Firefox, Google Chrome, Safari, Opera etc. It has been constructed strongly with the latest HTML5 and CSS3 so need to worry about the standard and quality of the coding. The trendy and eye-catchy look of SantaMas will simply catch everyone’s eye. Yes, this chic and sophisticated theme looks a perfect match for an event management website. Being a responsive theme, people can view your site flawlessly on hand-held devices such as smartphones and tablets. The trendy snowfall banner in the theme makes it superbly stylish and outstanding. Its amazing featured slider section, gallery section, and service section will make you love the theme more as it gives such a pleasant look and feel. Translation ready is also one tremendous feature included in the theme through which you can translate your site into some other preferred language of your choice rather than English. 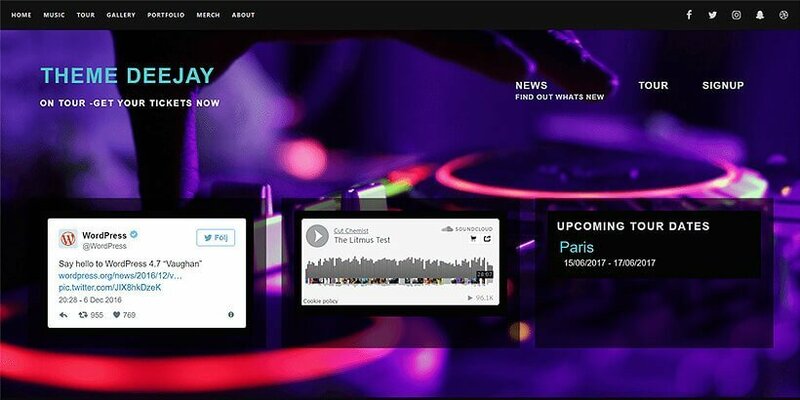 Deejay is a simple and sleek WordPress theme and is entirely based on a musical event. The look of theme simply defines a theme which suits perfectly for a company which focuses on organizing musical events and concerts. The theme is highly responsive and is easily adapted with smartphones, tablets of any screen size. With its live customizer, anyone can customize the theme comfortably and update some minor changes on the layout design of the site. Even for a layman, it’s just a piece of cake to modify the site. You can modify its header, footer section, and sidebar as desired. Also, add varieties of widgets in your site to make it look even better and admirable. 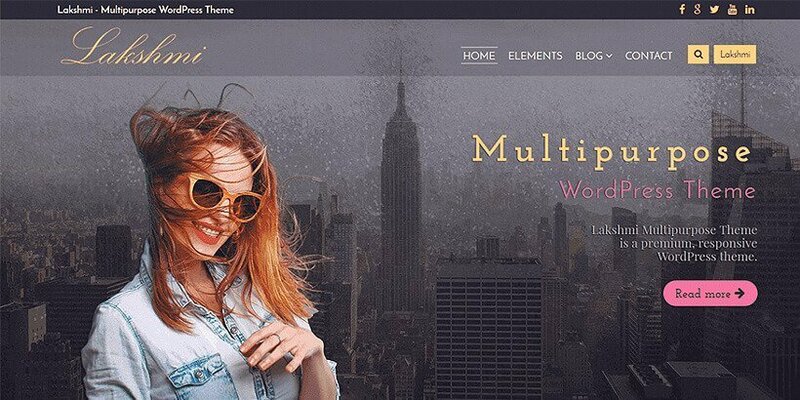 Lakhsmi Lite is a delightful and captivating event based WordPress theme. This simple yet stylish looking theme is specifically focused on promoting events such as fashion, concert, conference, food festivals and many others. The well-organized layout design and widgets make it a better choice for a complete and professional event WordPress site. The features included in the theme is quite unique and much exciting than any other theme. Its good compatibility with WooCommerce makes it more flexible and you can open an online store and display products and services to sell it around the globe. With the mega menu, you can set the submenu gracefully in your site. With the help of the font option available in the theme can make your website appear distinct. There you have it. Some of the best and awesome WordPress themes for event and conference management companies from our collection. The Internet is vast and you will find a wide range of WordPress Themes yet being doubtful about its standard. Since the above list of themes has been personally handpicked from the most elite WordPress companies so you can indeed be assured they are of high and fine quality. We hope that you liked our list of free event WordPress themes and you might use one for your company.